Easy, Quick, Spicy Pickles At Home – Food. Beer. Stuff. In five minutes these peppers and cukes will be turning into tasty, spicy, crisp pickles. I keep a small vegetable garden at home, in fact one of my favorite parts of summer is watching all of my hard work from the spring sprout up so I can begin to incorporate the different foods into my daily meals. Two of the most prolific growers in my garden just happen to be my hot peppers and my cucumbers. From July on I am more or less drowning in them so it didn’t take long for me to come up with an idea that can solve both of those problems for me. 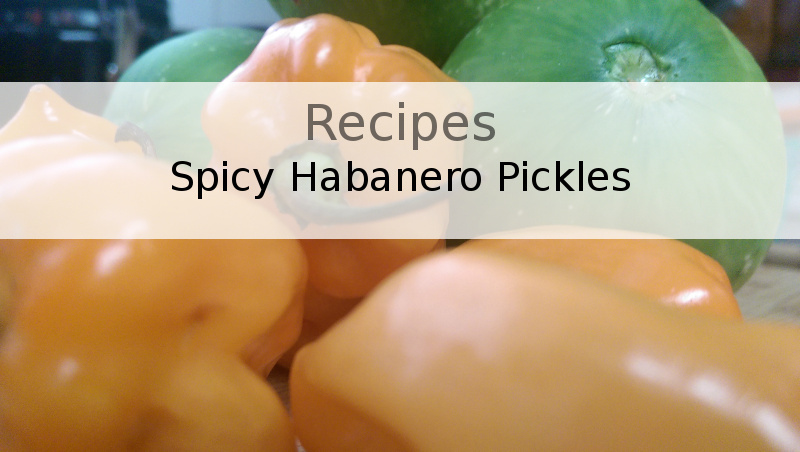 Today I will be showing you how I make one of my favorite snacks, spicy habanero cucumber pickles. I love pickles (heck even one of my cats is named Pickles) and all you really need to make pickles of any type is too much of some food, some vinegar and some kosher salt (other salts work well also just avoid salts with iodine added). The best part is, these pickles will only take you about five minutes per jar to prepare. Some people have slightly different measurements but I have always used this because of how easy it is to remember. Not to mention it always works out great for me and leaves me with great tasting pickles. Besides being easy to remember and tasting great I also find this method makes it easy to up or down scale to my needs, all you need to remember is 1 tablespoon of salt for every 1.5 cups of liquid and things will work out fine no matter how much or how little you need. From there you can sort of let your creativity show. When you pickle something, all of the flavors within fuse together which is what makes them so great. Dill and garlic are usual and for great reason but don’t be scared to try out some other herbs and spices. With pickles, creativity really is king. Don’t let convention blind you to all of the great flavor combinations you can come up with. Anyhow, with that said lets get on with this recipe. Certainly, you will also need some fresh cucumbers and habaneros. The amounts don’t really matter for this recipe other than you want to fill your jar. If you just want a little heat, use one or two habaneros. The more you add the hotter it will get. I will be using six habaneros and three small cucumbers because I want my mouth to burn with the fury of hell. Spears and slices in the same jar? So to get started, wash your cukes and then get to slicing. I like to mix it up with both spears and slices in each jar and I don’t worry much if that is the wrong thing to do. You could do halves or wholes as well but just remember the less you chop it up, the longer it will take to pickle. Now go get your peppers and do the same thing. 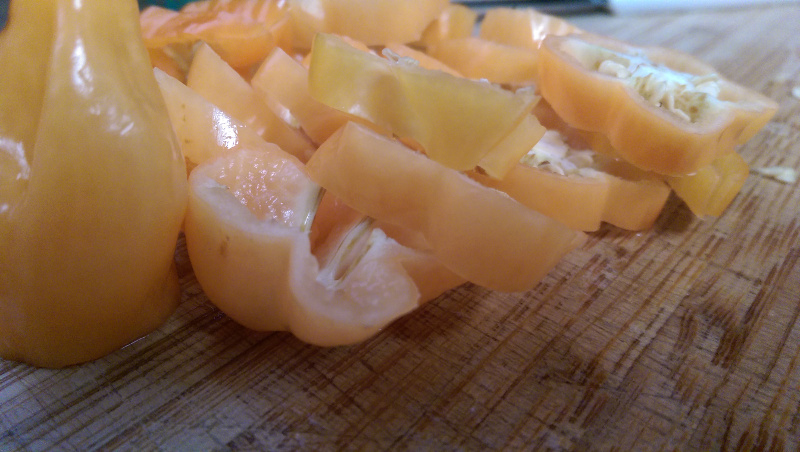 If you are going to keep your peppers whole, be sure to poke a few holes in them with a fork. I like to slice them up and use them in sandwiches. I always like to leave at least one whole for when I just want a heat fix. Rather than poking holes, I just slice off the very top. Don’t worry about it too much, just as long as the inside of the pepper makes contact with the pickle juice. Got everything sliced up? Good, we are almost done. This is also where we will be diverging from most pickle recipes. Take out your measuring cup and get your liquids measured. When doing a small batch like this, I will just get a large measuring cup and mix it right up in there. I measure the water up to 1.5 cups then I pour the vinegar right on top making 3 cups of liquid. After that I add the salt and stir until it is dissolved. You may be wondering when we are going to heat the liquid up. Well, I told you this was quick and easy so we are not going to heat this up. In fact, once your salt is dissolved you are ready to go. At this time you can go ahead and add anything else you want to the pickle juice. I put in the crushed red pepper and peppercorns and if I had any around I would of also added some dill seeds and a few cloves of garlic. So set aside your pickle juice for a second and go grab a jar. Mason jars are great, an old pickle or jelly jar will work fine, whatever you have is OK as long as it holds all your stuff and has a tight lid. 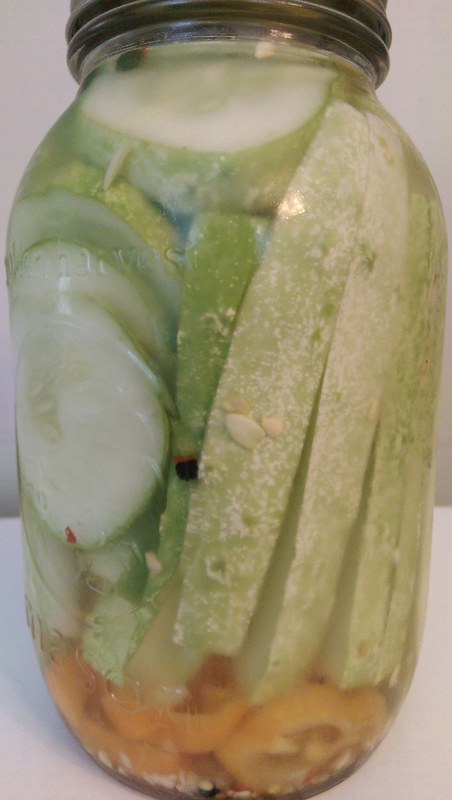 Fill your jar with your sliced pickles and peppers to just below the brim and add your liquid until it is a half inch or more above your cucumbers. Put on the lid, tap the bottom of the jar lightly on a table top until you stop seeing bubbles come up and then put your jar in the refrigerator. If you have some extra pickle juice, like I did, you can put it in the fridge for next time (it will stay good) or go pick some more stuff out of the garden. I had about a quarter of the juice left so I just put it in another jar of pickles I had that was nearly empty (did I mention you can reuse pickle juice once or twice as well with this method) and that solved the problem for me. You will want to leave the pickles alone for a few days. I like to give it a week, but I have been known to start eating them the next day. For the best flavor you will want to give it a minimum of 3 days. Well that’s it. All done, easy right? It probably takes longer to read this recipe than to actually do it. In the refrigerator, these pickles should stay good for a couple months. If you need your pickles to last longer than that, you will unfortunately need to go with a conventional pickling recipe. I always seem to eat mine right up, so freshness is never a problem. Let me know how this worked out for you in the comments and I’d love to see some pics of your creative pickling combinations. In a few days these spicy pickles will be ready.